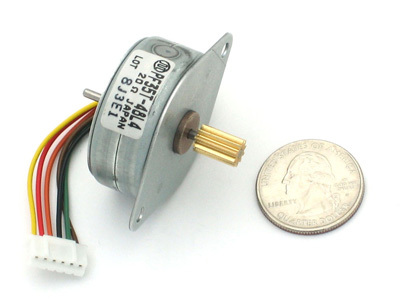 Small Stepper motor, perfect for driving a small robot, spinning gears, or for adjusting/indicating tasks. It has both smooth and toothed shafts. Solid mounting plate. To use with the Adafruit Motor Shield, connect green and red together to ground (middle), brown and black to one motor port (say M1) and orange and yellow to the other motor port (say M2). So in order, thats: brown - black - red&green - yellow - orange. Then just use the example code that comes with the Adafruit Motor Shield library. Easy to use with the Adafruit Motor Shield, and Adafruit Motor Shield library.